Raven, sometimes known as Coyote with Feathers, is infamous in native mythologies for his trickster antics. He steals the Sun. He steals Salmon. He steals wives. And on and on. In 2007, when we first returned the Sacred Salmon Ceremony to Ti'lomikh along the Rogue River, I was visiting with a friend who lived at the village site, downriver from the ceremony. She told me a story about her Raven buddy who lived across the road. She had a walnut tree in her yard, and Raven loved walnuts. He'd take them one by one and fly up over her driveway. He knew precisely how high to fly before he dropped them and they cracked open perfectly, every time. On a typical day, her driveway was covered with walnut shells, and Mister Raven was happily sleeping off his feast in his roost across the road. She liked Raven and didn't mind sweeping her driveway. On my way back from the Sacred Salmon Ceremony, I stopped by my friend's home for another visit, and found the driveway covered with stuff that looked like aluminum foil. Looking closer, I discovered it was salmon skin! Raven had heard our ceremony and flew the mile upriver to investigate. When no one was looking, he swooped down to the ceremonial fire where the salmon was cooking and nabbed a chunk. He flew back downriver, strutted around my friend's yard and munched down salmon, leaving the silver skin on the driveway. He made the round trip at least a dozen times. Curious, I went back upriver and asked around at the ceremony. Neither the Fire Tender nor anyone around who was helping, had seen Mister Raven. Except for one old woman who loved telling stories. She chuckled and said, "Ah, Raven. Well, I might have seen him. That's a good story. I think I'll add it to my repertoire!" 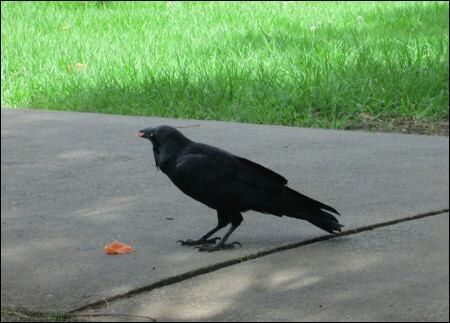 The photos show Raven munching a tasty tidbit of salmon, and a Raven gift from my daughter Irina on my birthday in 2018. 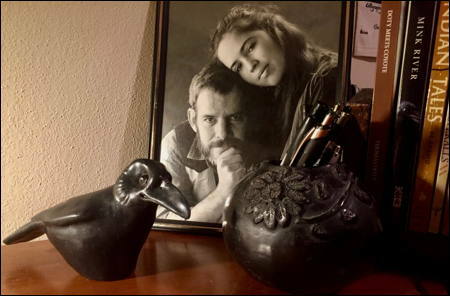 The photo on my writing desk is of Irina and I in 1992.